None. Like all of Universal Orlando’s kids areas, it has one entrance and one exit. 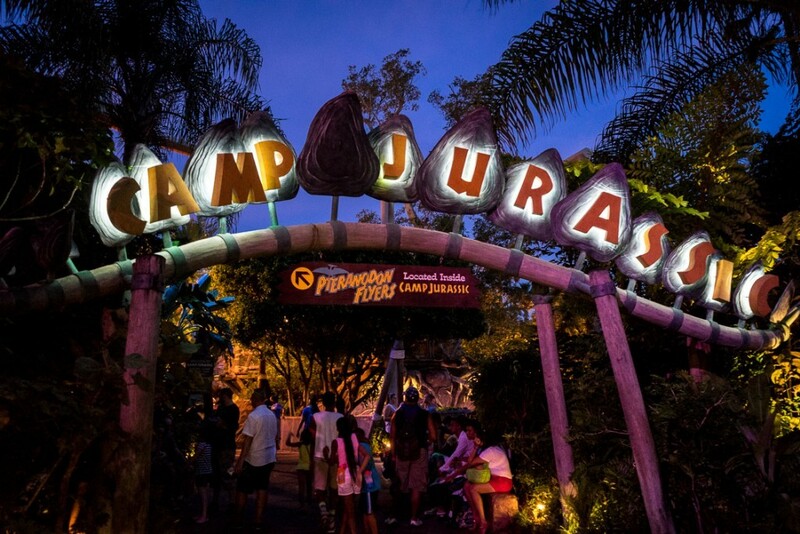 Camp Jurassic is a truly gigantic play area with everything from slides and climbing nets to caves and water cannons – and in our opinion, it is the most underrated “attraction” at Universal Orlando. Think Disney’s Tom Sawyer Island but with dinosaurs! Camp Jurassic at Universal’s Islands of Adventure. Try visiting first thing in the morning when the ground is covered with fog. This is the best play area out of all the play areas I've been in, at both Universal and Disney. I now have a 13 and 10 year-old and I have been doing play areas at amusement parks for a long time. It far surpasses Honey I Shrunk the Kids in Disney. It is entertaining to kids and adults. WARNING! Adults, you need to be physically able to climb stairs and have the balance to walk on uneven and moving surfaces before you follow your kids into the area! There are so many different things to explore. My favorite are the Caves. There's water, mist, sparkly gems. It is so cool!. Then there are the rope bridges. Not one, Not two, like a whole BUNCH! You can get lost in the rope bridge area. There are some wet areas too, be aware. There are water guns that are always being manned by someone and you can get squirted... A lot. These people mean business and they don't differentiate between kids and adults! If your kids (or you yourself) need to blow off steam, this is a great place to visit. We visited Camp Jurassic with our grandkids while our kids and their spouses rode the roller coasters. I thought it would be a nice little playground where the kids could play and me and my wife could relax for awhile. Boy was I wrong! They had us climbing over and through all sorts of rope ladders and swinging bridges. We went through caves and walked in a jungle. So many things to do and the grandkids probably had one of their best times at the park. I was glad to have that time to spend with the family and it will be a lasting memory for all of us. A hidden gem for kids and adults alike! Date Of Last Visit: Many, many times. I'm an annual passholder. I come to the parks very, very often. And Camp Jurassic is one of the can't miss things on my trips. It's full of all sorts of fun areas to explores, and is one of my favorite memory building spots. The Caves: Inside the cavern area are some walking paths that lead by some geysers and water features. It's nice and cool inside, which is alone a great reason to visit on a hot day. But the best part is a rope bridge over the largest geyser. I always had fun waiting for the geyser to blow - you don't get as wet as you'd think, but it's still fun! The Echo Cavern: When you first get into the camp, go down the stairs to your right, and you'll find a small little nook with a sign. It's designed so that if you speak into the tunnel, you get an absolutely flawless echo of everything you say. I have wasted countless hours shouting silly things in there. "Shut up! No you shut up! No you!" is a perennial favorite. The Water Guns: This is my absolute favorite part. There are two water gun areas in the camp. The first is past the echo caverns behind a containment gate. There are four of the infamous spitting dino, Dilophosaurus, and yes, they do spit a quite impressive burst of water. These have limited left to right motion, but the dinos' crests make a great shield. The second area is upstairs, and predictably looks down on the dinosaur containment area. The guns here move both left to right and up and down, but have a complete lack of shielding. Also of note: on some days, the water doesn't flow properly to the upper guns, and the pressure only allows one gun at a time to fire. While this sounds like a major disadvantage, it actually created a new strategy that worked to our advantage up top. We took turns firing, thus changing the targets for our adversaries down below, and giving us precious seconds to squirt them before we were blinded by water and had to pass it on. Overall, Camp Jurassic is well worth a visit if you've got the time for it, especially with kids. It's a great place to make new friends (and enemies, at least for the round! ), and get away from the crowds and heat.